Best GoPro Wearable and Mountable Cameras: This is a roundup of a specialized group of GoPro cameras made for sharing your active lifestyle on video. These “action” camcorders can be worn on your person, or mounted to your bike, helmet, or even surfboard, depending on the accessories included. They are used by motorsports professionals and race teams. These camcorders are shockproof and water proof (to 60m), ready for rugged environments. GoPro Cameras have been used on TV shows (such as Gold Rush, The Bachelor, Deadliest Catch), to film unique perspectives. The latest models have built-in WiFi, and 4K Ultra HD Resolution, and the Hero 7 Black with Hypersmooth stabilization. They all have wide angle lenses to get all of the action. 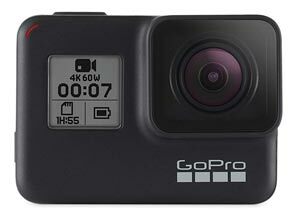 See the top GoPro models below and compare by price, reviews, imager size, and features. A glossary of features (lower on the page) will explain the features listed. GoPro Hero7 Black Edition = The 2019 Hero 7 Black has many new features, including the fantastic HyperSmooth image stabilization, which delivers excellent stabilized video even at 4K60. Time Warp Video, provides time lapse movies that are a lot less shaky. The Hero 7 Black is the first to provide live streaming (at 720p) to social media such as Facebook. Other new features are portrait mode, a self timer, and better sound. GoPro Hero6 Black Edition = The Hero 6 has a new GP1 processor which will give you better colors, and picture quality, as well as higher framerates. Also introduced on the Hero6 is 5GHz Wifi, for up to 3x faster throughput. MicroSD Card Slot = This refers to the way the camcorder records video. GoPro cameras record to MicroSD cards. Built-in WiFi = GoPro cameras have built-in WiFi capability to use with accessories. The range of the remote is up to 600 feet. The camera can be controlled by iOS smartphones and tablets running the GoPro App*. The GoPro App enables full camera control and scene preview on any compatible iOS smartphone or tablet. An Android App is available at the Google Play store. 5Ghz Wifi = The GoPro Hero 6 introduces 5Ghz Wifi band, which will provide about 3x the WiFi speed of previous models. Imager Size = This refers to the Imager of the camcorder, where the light hits from the lens. This is like the retina of the eye. The larger the imager, the better the quality of the video and better low light performance. High end camcorders generally have a larger imager. Larger is better. A 1/2.6-inch imager is double the size of a 1/5.2-inch imager. GoPro uses a 1/2.3-inch Imager, which is excellent for low light. H.264 Capture = The Black Edition GoPro Hero5 and Hero6 Camera supports a bit rate up to 60 Mbps high video bitrate capture (H.264 compression). The higher the bitrate, the better the quality of video. Wide Angle 170° = This refers to the field of view in degrees. The 170 means a 170 degree field of view which is extremely wide and will get most of the action in front of you recorded onto the video. This is accomplished with a wide angle lens. You can change the angle of view. Megapixels = This refers to the camera function in the camcorder. This is the amount of megapixels available to take a snapshot picture while using the camcorder. 4K, 2.7K, 1080p 720p 30fps 60fps video = camcorders can record video at various resolutions. Many can record at several different rates. 4K and 2.7K are resolutions higher than Full HD. 1080p is blu-ray quality and is Full HD. 720p has about half the resolution of 1080p. Also keep in mind the frame rate of the video. Normal video is shot at 30fps (frames per second). Some camcorders can shoot at 48fps, 60fps, 120fps, and even 240fps which will make the movie action much smoother and later can be used for slow motion as well. 60 fps is also expressed as 60p or 60 progressive frames/second. External Mic Jack = This means that this camcorder is equipped with an external microphone jack or terminal to input an external microphone. It bypasses the built in microphones.